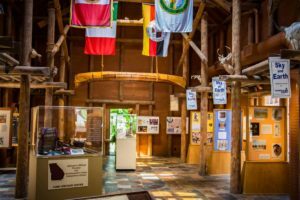 Visitors to the John H., Sr. and Ethel C. Bennett History Museum enter through the Childre Family Grand Lobby, an area 50 feet in length built to resemble an Iroquois longhouse. Several Iroquois families would have lived communally in a structure similar to this one (evidence suggests that the Iroquois and Cherokee Indians may have been related). The left and right "wings" of the Bennett History Museum were inspired by the architecture of the Mississippian era -- the temple mounds and permanent homes that were built here in the Southeast were very different from the structures of Indians living in other regions of North America. The Childre Family Grand Lobby features items that would have been found in the home of a Southeastern Indian family and items brought over by the Europeans. Before building a Longhouse, men went into the forest to find young elm, cedar, or birch trees. They peeled the bark from the trees, dried it, and cut it into large sheets. They made long wooden poles from the thin tree trunks. On a clear, flat area of ground, the men traced the shape of the longhouse in the soil and dug deep holes into which the poles would be placed. To make the framework, the builders set the poles into the ground about 3 feet apart. The tops of the long poles were bent toward the center and strapped together with bark strips. The roof was curved or peaked so that snow would slide off and not cause the building to collapse. Inside the Longhouse was one big room, which was sectioned off from one end to the other and divided by a central corridor. Individual families lived in each section, and each section had a fireplace which was shared by families on both sides of the building. The fireplaces were dug into the floor, and holes in the roof allowed smoke to escape. Wide sleeping bunks were attached to the walls, with storage shelves above them.